Emirates NBD, Dubai's largest bank, said it would seek shareholders' approval to boost its foreign ownership limit to 20 per cent from 5 per cent and raise capital by Dh7.35 billion. The bank will be holding a general meeting of its shareholders on March 27 to get their approval for the two key proposals. In a posting on Dubai Financial Market site, the bank said capital boost would be through the "issuance of new shares (nominal value of Dh1) for a subscription price per share at no less than 10 per cent discount to the prevailing market price." Emirates NBD currently has total equity of Dh59.4 billion. The lender said it would be seeking shareholder approval to raise its foreign ownership limit to 20 per cent. "The participation or contribution of nationals the UAE at any time shall not be less than 80 per cent of the share capital of the company," the bank said in its notification for shareholders' meeting. Analysts said the change in the foreign ownership limit might lead to the bank's inclusion in MSCI's emerging markets index. The move to boost capital comes as the Dubai-based lender prepares to submit a bid for Denizbank, the wholly owned Turkish unit of Moscow-based Sberbank. A deal for Sberbank's 99.9 per cent holding could be valued at about $3.69 billion, according to calculations. In January, Emirates NBD said in a statement it routinely evaluates potential opportunities in different markets and that discussions with the Russian bank are at "a very preliminary stage" and there is no certainty that any transaction will be entered into. "A further announcement will only be made if there is a material development," Dubai's largest lender by assets had said. With total assets of Dh470.4 billion, Emirates NBD group, which has a significant retail banking franchise, currently has 230 branches in the UAE and overseas. 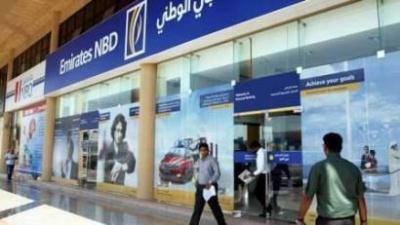 Emirates NBD, which acquired BNP Paribas' Eygptian banking business in 2013, has been scouting for opportunities in the Turkish banking sector for several years as part of its international expansion. In 2017, after opening its first branch in India, the bank said it would grow its branch network in Egypt and Saudi Arabia and open a representative office in Turkey in 2018. Moscow-based Sberbank has been evaluating opportunities to sell its 99.85 per cent holding in the Turkish lender. Banks from the Gulf, including Emirates NBD, and China were among those interested. Sberbank, Russia's biggest bank by assets, bought Denizbank in 2012 for around $3.5 billion as it was trying to establish a presence abroad. On Sunday, the bank's shares gained 13.6 per cent, the most in more than three years, to close at 10 dirhams in Dubai. About 18.5 million shares were traded, about 19 times the 3-month daily average, according to data compiled by Bloomberg.